The PCE-RGB colour meter is based on a very accurate and modern micro system technology which operates according to the spectral method. A defined source of light illuminates the sample. The light is reflected by the surface and is measured spectrally. The result is shown on the display of the PCE-RGB 2 colour meter. With this device you can also take a relative measurement of a luminous surfaces, such as LCD. The results taken by the PCE-RGB 2 colour meter are shown on the display and can also be transferred to a computer for further analysis by using the optional software and RS-232 connector. The application range of the device is quite wide. It can be used in quality control for colours in production, for the measurement and identification of colours received by shipping in QM systems according to DIN EN ISO 9000, for checking colour distances in colour tests and for colour standards such as in measuring an absolute colour value. 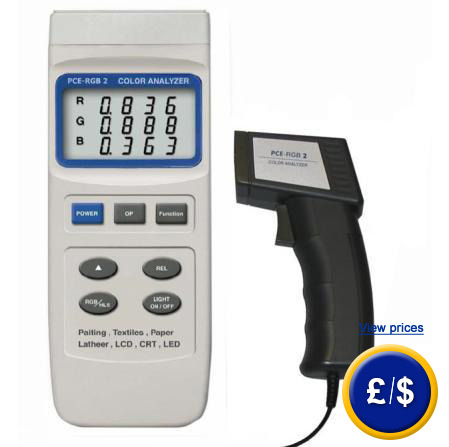 If there are any questions about this PCE-RGB colour meter please have a look at the technical specification below or call: UK customers +44(0) 23 809 870 30 / US customers +1-410-387-7703. Our technicians and engineers will gladly advise you regarding all colour meters and all products in the field of measuring instruments, regulation and control and scales. The software for the transfer and display of the measured data on a computer or laptop can be purchased as an optional equipment. The professional software has a simple menu navigation. It also features the option to archive a detailed, well arranged view of the measurement procedure. Colour meters can be used on different surfaces and sub-surfaces. They can determine absolute colour values (the colour position) or can be used to measure relative comparatives. 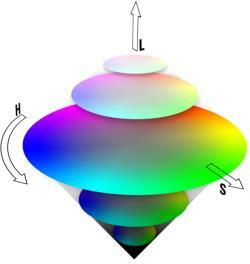 The RGB colour space is a basic additive colour model which is mixed with white. One colour is defined by three values: red, green and blue. Each colour percentage can vary between 0% and 100%. The formation of the RGB colour space is developed according to the theories and research on color perception. Aside from the RGB colour space, there is also an HSL colour space, which includes hue, saturation and luminance. The HSL colour space does not consider a white point as one without colour, but as a point of grey, somewhere between black and white, such as neutral grey. It is represented as a sphere, a cylinder or a prism with six sides, with the hues and grey point in the centre.